In 1837, Britain was still a rural nation with 80% of the population living in the countryside. Most people were farmers or spun wool and cotton to weave into cloth. Soon new machines were invented that could do these jobs in a fraction of the time. This left many people out of work, so they flocked to the towns in search of jobs in new industries. By the middle of the nineteenth century over 50% of the population lived in towns and cities. The Industrial Revolution rapidly gained pace during Victoria's reign because of the power of steam. Victorian engineers developed bigger, faster and more powerful machines that could run whole factories. This led to a massive increase in the number of factories (particularly in textile factories or mills). By 1870, over 100,000 steam engines were at work throughout Britain. The industry depended on steam and steam depended on coal. The number of coalfields doubled between 1851 and 1881. 1856 - Henry Bessemer invented a method for converting iron into steel quickly. Ships, bridges and building could now be bigger. Despite the growing wealth due to trade and commerce, many of the working people, who actually produced the wealth, lived, worked and died in very poor conditions. Most cities and towns were not prepared for the great increase of people looking for accommodation to live near their work place. There was a shortage of houses, so many people had to share a room in other peoples houses. Rooms were rented to whole families or perhaps several families. Often ten or twelve people shared one room. If there was no rooms to rent, people stayed in lodging houses. Many factory owners built houses for their workers near their factories. The houses were built close together really quickly and cheaply. These houses often had two rooms downstairs and two rooms upstairs. They were not really big enough for the large families people tended to have during the Victorian time. The houses also did not have running water and toilets. Up to 100 houses had to share an outdoor pump to get their water and share an outside toilet. To make things worse, the water from the pump was often polluted. The household rubbish was thrown out into the narrow streets and the air was filled with black smoke from the factories chimneys. Dirty streets and cramped living was a perfect breeding ground for diseases. More than 31,000 people died during an outbreak of cholera in 1832 and lots more were killed by typhus, smallpox and dysentery. Public Health Act of 1875 banned open sewers, thanks to Joseph Bazalgette’s sewage system. Houses were made further apart, rubbish collection was introduced and public health inspectors had to be provided by the local council. They basically had to go round whatever town or city they were employed in and check that sanitation and health of the people was alright. In 1853, the tax on soap was taken off, meaning poor people could buy it and become more hygienic by washing with it. Many factory owners put profit above the health and safety of their workers. 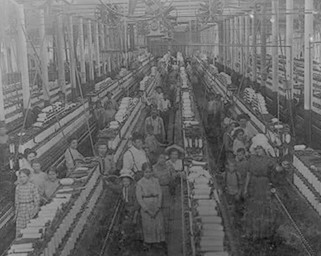 Children and young women were employed in terrible conditions in textile mills and mines. Furnaces were operated without proper safety checks. Workers in factories and mills were deafened by steam hammers and machinery. hours were long and there were no holidays. Children banned from working in textile factories under the age of nine. 9 - 13 year olds limited to 9 hours a day and 48 hours a week. 13 - 18 year olds limited to 12 hours a day and 69 hours a week. All children under eleven to have two hours education a day. Government Factory Inspectors appointed to enforce the law. All women and children under 10 were banned from working underground. No one under 15 years was to work winding gear in mines. Minimum age for working in factories reduced to 8 years old. 13 to 18 year olds to work a maximum of 12 hours a day and the same applied to women. Safety guards had to be fitted to all machines. Three hours education a day for children. 10 hour day introduced for under 18's and for women. 1864 Factory Act, this extended the regulations to factories other than textiles and coalmines. 1867 Factory Act, the legislation was extended to all workshops with more than 50 workers.